I think I’ve only met a handful of people in my life who don’t like pumpkin pie. Naturally sweet and quickly associated with holidays and time spent with family and friends, pumpkin is a delicious and comforting food. Like many, I used to use store-bought, canned pumpkin puree for my pumpkin pies. 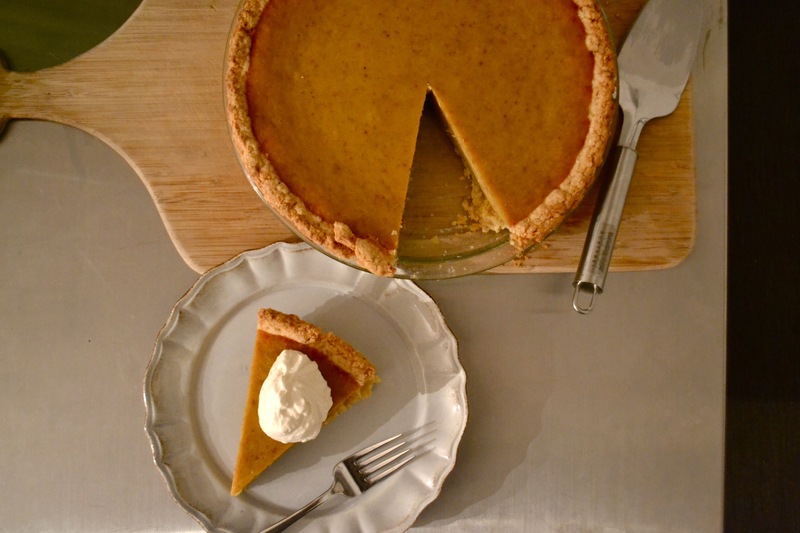 It meant I could whip up a pumpkin pie–ready for baking, in a matter of minutes, and since I bought organic pumpkin puree, I figured it was just fine. And it was just fine, that is, until I took the extra step of roasting my own pumpkin. It takes a little bit of pre-planning, but only adds about 10 more minutes of actual work, and I believe the outcome is superior. 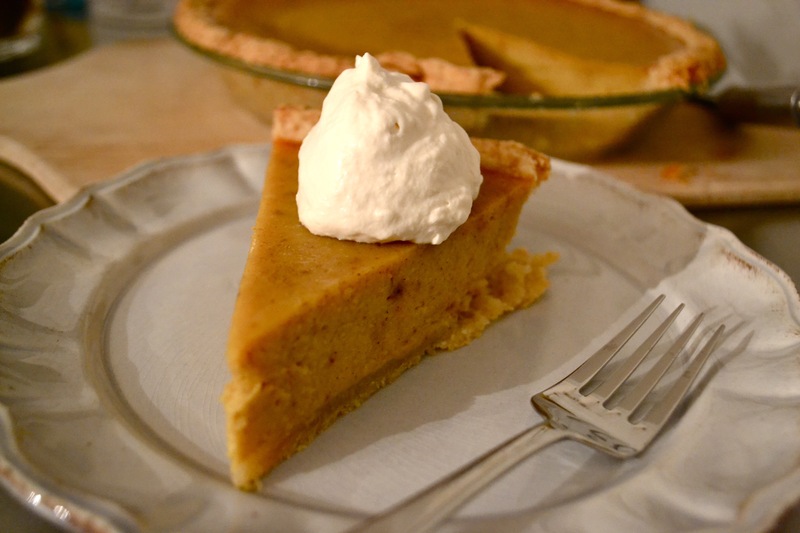 Interestingly enough, I think canned pumpkin actually tastes more “pumpkiny,” but fresh pumpkin puree imparts a subtly better flavor and an incredible freshness to your pie. I’m convinced it’s worth the extra thought and 10 minutes of extra effort. 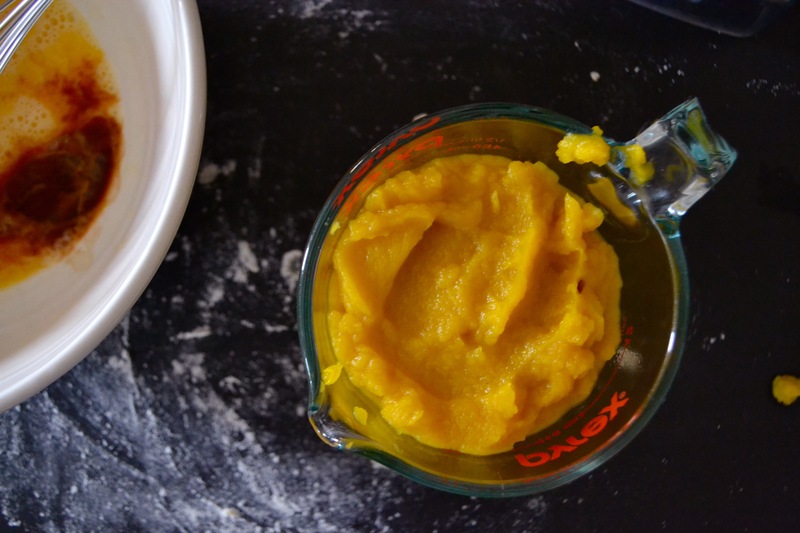 It’s also super easy to make your own fresh pumpkin puree! Preheat oven to 375F. 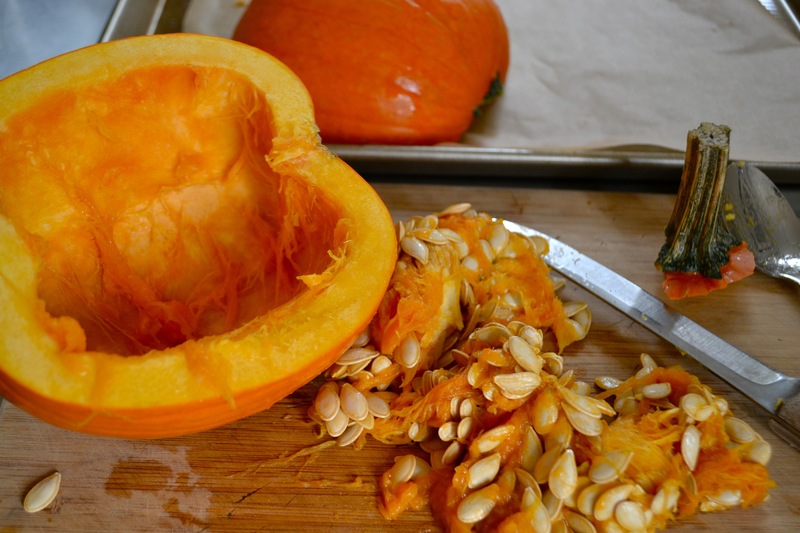 Cut your pumpkin in half lengthwise, and scrap out the seeds. Place each half face down on a rimmed baking sheet lined with parchment paper, and bake for 35-40 minutes or until a fork inserted in the flesh goes in easily. And assuming you like to be efficient like me, while the pumpkin is roasting you can make the crust. Whisk together flour, sugar and salt. Using a food processor (on pulse) or a hand-held pastry cutter, cut in the butter until the texture resembles coarse crumbs. Mix in a little of the water and cut or pulse until the dough comes together. (Do not over mix.) Gather the dough into a slightly flattened ball, wrap in plastic wrap and chill for up to 8 hours in the refrigerator. When you’re getting ready to make your pie, roll out the dough into a circle wide enough for a 9-inch pie dish. Form the dough to the dish and return to the refrigerator. Once the roasted pumpkin is cooked and cooled enough to handle, scrap out the cooked flesh and puree in a blender or food processor. Measure out 1 1/2 cup of puree for a 9-inch pie. In a medium bowl, whisk eggs lightly. 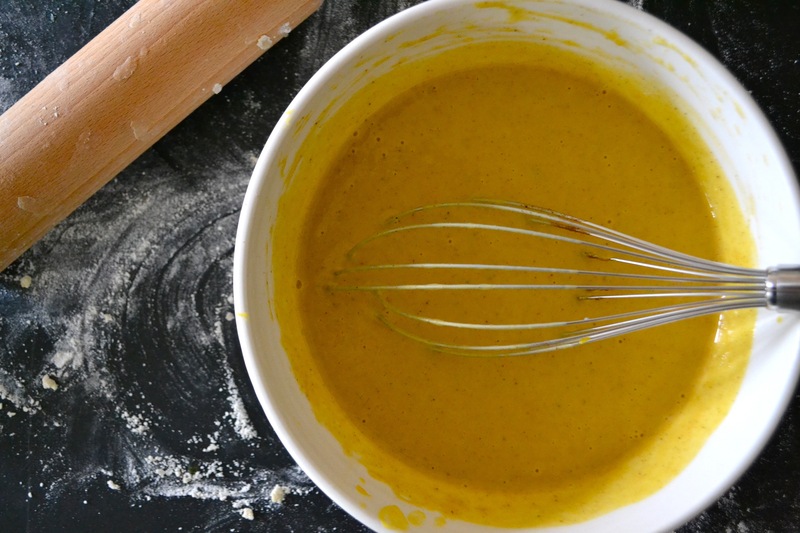 Whisk in pumpkin puree followed by condensed milk, vanilla and spices. Whisk until thoroughly blended. Pour into pie shell. Bake at 425F for 15 minutes then reduce temperature to 350F for an additional 35-40 minutes. Thoroughly cool pie before serving (1-4 hours depending on how firm and how cool you like your pie). Serve with vanilla- or bourbon-laced whipped cream. *You can substitute 1 1/2 cups evaporated milk and 3/4 cup sugar for the sweetened condensed milk. This is a good option if you want to use a particular type of sugar, e.g., coconut crystals. Gorgeous pie. What a perfect slice, too! This is beautifully done 🙂 I’d love to have you at my Thanksgiving! I hope you had a wonderful Thanksgiving! I got so behind that I didn’t see your comment until days later. I’m curious what you cooked!? I hope you did too!! And yes, the last thing to do (or that there’s time to do) during Thanksgiving is sit down and blog! We celebrated Thanksgiving at my parents’, so all I did was help my mother this year — she went all out with a mix of Chinese and American dishes! Lamb, eggplant in garlic sauce, Sichuan fish stew, turkey, sticky rice stuffing, Korean dduk and japchae. I did contribute a platter of gingersnaps all on my own 😉 How about you? I’m sure your spread was fantastic. Your dinner sounds amazing, especially given my natural preference toward ethnic foods (I’m half Japanese, btw). I didn’t host this year–the first time in many years, and only had to contribute a few dishes. I made the brussels sprouts, leek and pomegranate salad I blogged a few weeks ago, the pumpkin cheesecake and a great appetizer which I’ll post later this week. Super easy. Have you posted the Sichuan fish stew? I’d love to see that if you haven’t. I couldn’t agree more! I’m roasting one right now so my wife can make the pie tomorrow. Happy Turkey Day, Jon! I bet you’re going to cook up an amazing feast for you and yours.